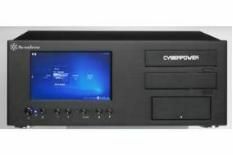 Cyberpower Music Infinity Pro review | What Hi-Fi? Cyberpower is a name associated with gaming PCs, but now the company is eyeing-up the media centre market. The Music Infinity Pro has plenty of raw power, but there's a lack of operational finesse and the odd missing feature. The power comes from a mighty specification that includes an Intel Q8200 Quad-core processor, 4GB of RAM, and a 512MB Radeon HD4670 graphics card. Two 1TB hard drives are configured in a RAID 1 array, so one backs up the other; but they could be linked to create a huge, though unprotected, 2TB of storage. The PC, in its Silverstone casing, is capable of impressive performance. An uncompressed rip of Marmaduke Duke's Rubber Lover, played through Media Center, is detailed, balanced and dynamic, with all the punch and attack necessary to reproduce the track's dance-inducing pop hook. Standard-def pictures are impressive, too. Freeview pics are sharp, vibrant and clean, while upscaled DVDs prove stable and natural. There's a touch of softness, but it's far from terminal. More disappointing is the absence of a DVD library in Media Center, a must-have for many. To watch a Blu-ray you have to quit Media Center, delve into the menus to enable 24fps playback, and open Cyberlink PowerDVD. Inconvenient; but we've yet to see a PC that plays Blu-rays from Media Center, so we won't mark the Cyberpower down for that. We will mark it down for a lack of any HD audio support. As CD and Dolby Digital 5.1 playback proves, the Xonar D2S is a capable sound card, but if you're buying a £1500 Blu-ray-toting PC, it's fair to demand HD audio playback. It's a shame, because Blu-ray pictures are impressively sharp and detailed, and other than very occasional motion judder, are just about the equal of those of a dedicated, budget player. There are other problems. We encountered regular errors when playing Blu-rays that were caused by the built-in screen. We occasionally had to disconnect it at the back and/or the PC. The bundled keyboard and mouse is wireless, which is fine for desktop use, but if you want to control the system from the sofa a MediaCentre remote is also supplied. So, it's powerful, but flawed. With greater care over usability and home cinema spec, this could be a real winner.